Publisher Big Fish Games has certainly got the hang of porting its old PC games to the Nintendo 3DS. After releasing many of them as retail games in PAL regions, it has started to hawk them on the 3DS eShop as well. 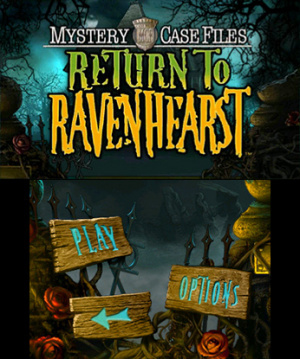 The original Mystery Case Files: Return to Ravenhearst was released in 2008 for the PC and is an evolution of the Mystery Case Files games. 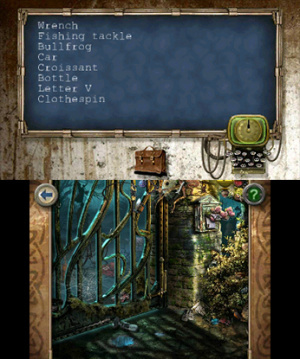 It's not just a hidden object game anymore, and is more of an adventure-style game mixed with hidden object screens. You have to search for objects to solve puzzles and there's a notable amount of backtracking involved. Return to Ravenhearst continues the story of the original Ravenhearst, but is also perfectly playable without any knowledge of the original game. Return to Ravenhearst is played entirely on the bottom screen of the 3DS, so don't expect any fancy 3D effects. The game looks and sounds atmospheric, but is hard to enjoy due to the unwieldy controls and navigation. In the PC version you could move your mouse-driven cursor around the screen and it would change in an arrow (to move to a next screen) or magnifying glass (to study an object) if you moved it over an interactive area. However, this cursor is naturally absent from the 3DS version, so the player often has to guess with which objects can be interacted with. To help a little, the stylus can be briefly held on the screen to display all the interaction options, but it's not a perfect solution by any means. The lack of a cursor for decent navigation makes the game more frustrating than fun. The hidden object puzzles aren't hard to locate, however — they are shown by glittering stars, just like in the original PC version. However, those hidden objects scenes aren't very enjoyable either. First of all, the screen is just too small. 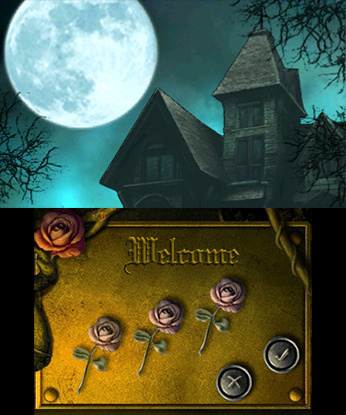 Unlike on the iPad or PC versions, the hidden object scene doesn't fit on the screen as a whole. That means the player has to scroll through it, making it even harder to spot the hidden objects. In many of those scenes some objects are almost impossible to find; they blend into the background or are placed near a very dark object. You can use the game's hint system to overcome this problem, but if you use it you then have to wait for your help meter to refill. We often found ourselves just waiting for the meter to refill, because the last object was practically unfindable. In other instances, the developer hasn't take the small screen of the 3DS into account. More things – symbols on walls and so on – are just too small to see clearly. Sure, you can look into the diary (displayed as symbol on the bottom left on the screen) to read more of the story and get a better picture of encountered symbols you may need to solve a puzzle, but this is incredibly cumbersome. The diary takes a few seconds to load, as does flipping pages in it. Even moving from screen to screen in this game is a slow and tedious process that will make the player stare at a blank screen for a few seconds each time. The slow switching of screens is annoying, and is even more troublesome since you have to do a lot of backtracking in Return to Ravenhearst. Some puzzles require objects found elsewhere in the game to solve. Unfortunately, the backtracking is not always very clear, and you'll find yourself replaying entire scenes in an attempt to track down a single item. Finally, there's the question of price. While not extremely expensive, Return to Ravenhearst for 3DS is twice as expensive as the same game for PC and iPad – and those versions are even a lot more enjoyable due to better controls and larger displays. While we usually try to avoid comparing games we review with ports on other systems, in this case it's hard to stomach paying more for what is essentially a vastly inferior product. 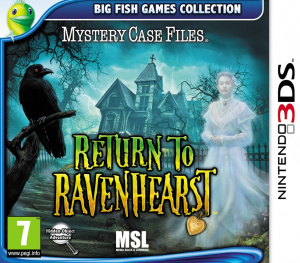 At first Mystery Case Files: Return to Ravenhearst looks promising. The graphics and sound are atmospheric and the story seems intriguing. Sadly, once you get to play it, it's very hard to enjoy. The controls are cumbersome due to the lack of decent cursor, the hidden object scenes are too cluttered for the small screen, the constant backtracking is tedious and switching between screens takes too long. All in all, Return to Ravenhearst will scare even the most enthusiastic hidden object fan away before the game is finished – and that's not because of the spooky story, either. How many of these games are there? @MAB I don't know what your problem is with the 3DS, but it is still the best dedicated gaming handheld out there. No, it does not have Vita's larger and prettier screen, but unlike Vita, it actually has dedicated original software coming out for it that is only available for it. I admit that so far in 2014 3DS has not been blowing it away on the software front, but its gaming library as a whole is great overall and will only get better with time. I know you would rather have your vaunted Sega's handheld, but they will never be making one again, so be happy with what you get. 3DS is the only thing keeping Nintendo afloat right now, so it would be nice if you would stop trashing it in every article. I love games from Big Fish inc Ravenhearst on my Nexus 7. Part of my bedtime routine. Great for a £1.50 on Android .... Prob doesn't provide value, look or play well on 3ds. @IceRod The Vita has the advantage that PSP stuff (What is available) actually looks better on it (And there is loads of it that is great across a diverse set of genres. Like the DS but DS stuff looks awful on the 3DS). Too bad you will have to re-buy those said PSP games digitally in order to play them, since the VITA lacks UMD suport and doesn't even support ALL PSP games. Only PSP games offered on the PSN will actually work, the rest (such as Portable Ops Plus) won't run and that the VITA has a horrible and greedy memory management system that requires you to spend upwards to 80$ on memory if you intend to download more than 5 games. Posting on this thread very late but figured I would pass along some info. Not having a timer is important to me as my eyes are not that good anymore. I also play these games to relax, not try to beat a clock that punishes you by erasing all of your progress and making you start over.